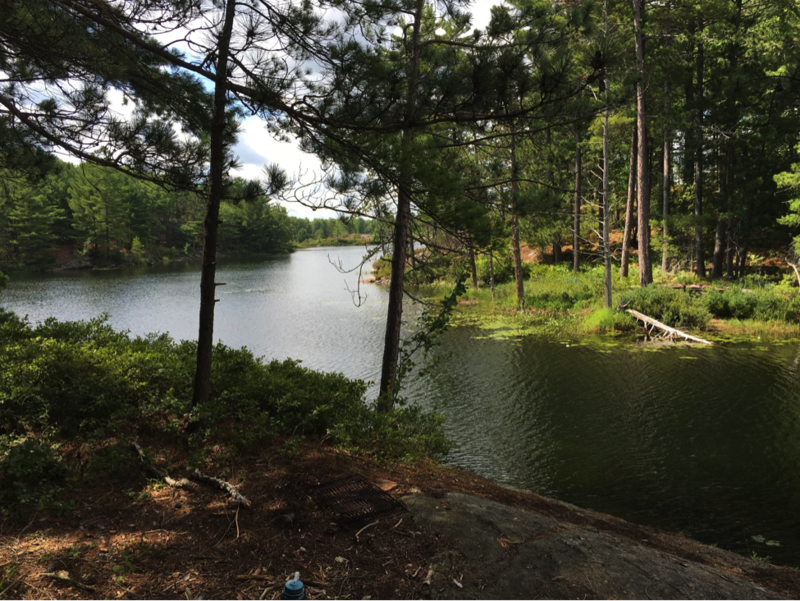 Earlier this year I took my Mom for an over night mother-son camping trip to Fishog Lake. We launched from the Trailer Park on Head lake and paddled leisurely up the Head River to Fishog. This route is very scenic and can be done in a couple hours with not much experience. After just skimming the surface of the park and hearing stories of lost portages through bogs and waterways I needed to go back to explore deeper within. In late August a random Friday off fell into my lap with little notice, so I did what any camper would do and started packing all my gear. I didn’t have any sort of plan but I knew I would be driving somewhere with the canoe strapped to my car Friday morning. During the chaos of organizing and researching possible 2-3 day routes, I had a sudden moment of revelation and realized this would be the perfect opportunity to explore deeper into the QEW. I called up my good friend Burnie to join and all of a sudden we had an impromptu weekend of adventure planned. With little foresight and research, I printed off a map by Explore the Backcountry, decided to launch from Head Lake, and picked a lake in the distance that I thought was attainable. Our route would take us from Head Lake to Scrabble Lake, through narrow lakes and tight rivers. We arrived at Head Lake at 11:00am. Head Lake is a good starting point for many different routes leading into the park. It offers three different access points which can be seen on the Explore The Backcountry’s topo map. 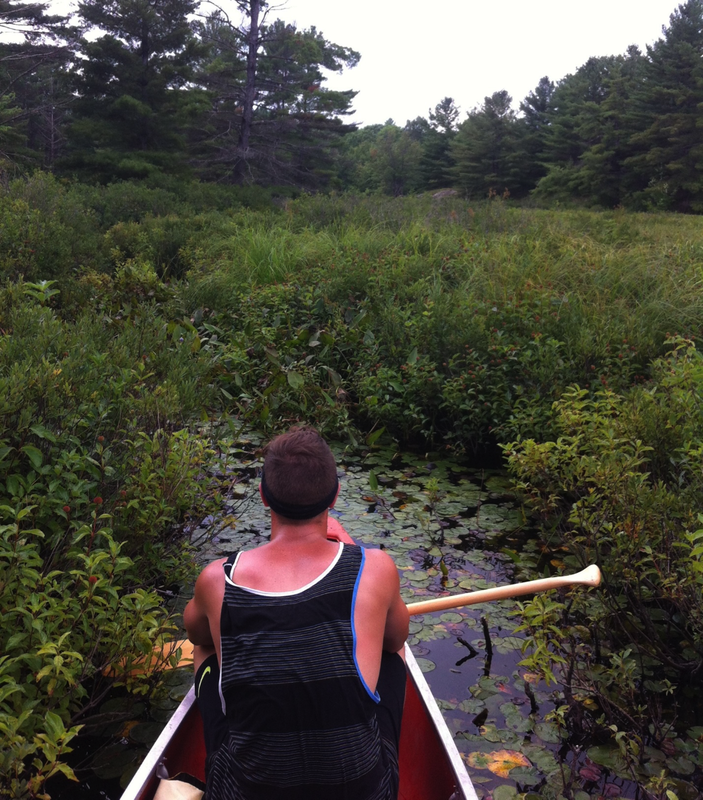 The lake is your typical Kawartha cottage country lake and is relatively large for canoeing. Be mindful of fronts rolling through because you won’t want to get stuck in the middle when the wind picks up...we’ll get to that later. We launched from the public boat launch on the East shore and paddled the 4km across the lake to reach the Head River. The river is located in the Northwest corner of the lake and if don’t have GPS you can just head for the islands, the river is hiding right behind. Along the way we took our time fishing for smallmouth and basked in the beauty of the glacial sculpted gneiss islands that is a trade mark of the Kawarthas. The Head River winds around for 2.5km and is not more than 10m in width. Along the way an old man-made dam requires a 100m portage with a steep put-in and take-out. There is a little waterfall on the right which will be the only moving water you’ll see on this trip. Eventually the Head River will open up into Fishog Lake which is the start of the Queen Elizabeth II Wildlands. 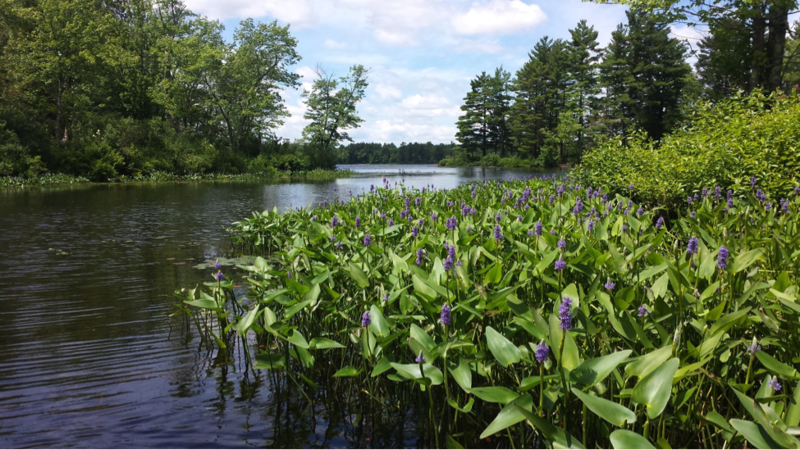 This lake offers many campsites and is a good destination for beginners. Unfortunately, the ease of accessibility and the lack of maintenance of the park is seen here. Most campsites have built tables and garbage left from past careless campers. From Fishog we made our way to the Digby Creek which can be found on the Western shore of Fishog. A sure way to locate the Creek is to look for the 1953 Gostlin Hunt camp. The camp is an old wooden cabin built at the head of the creek. We were not sure what to make of this place and/or if people even visited the camp anymore. I’m usually not a fan of seeing cabins on canoe routes, but this one was a real treat and you can’t help but think of the stories that must have came from this place back in the day. The Digby Creek to Red Boat Lake is roughly 2.5km and comprised of six portages through a tight swampy waterway. Most portages are marked with an orange ribbon and word in the woods is that the route was last cleared in 2012. The trails have a lot of overgrown brush that requires crashing through but the trails themselves are identifiable and straightforward to follow. A portage that is worth noting is the second 295m portage. The access point is at the bottom of a cliff and requires some steep, rocky, manoeuvring to get up and over the starting section. Be very careful in wet conditions! The Digby creek into Red Boat Lake took us a little under two hours to complete and is comprised of steep rocky shoreline and thick vegetation. We reached Red Boat by 5:30pm, set-up camp on one of the two sites the lake offers, and spent the night fishing. We had the entire lake to ourselves other than an old abandoned cabin and a small simplistic cottage that had no one home but looked maintained. We’ve heard rumours of great fishing on Scrabble lake, and because this was as much a fishing trip as it was a camping trip, we planned our route so we could spend time relaxing and fishing. We woke on Red Boat at 7:00am and spent a decent chunk of the morning having a fire and coffee. Our route would continue on Digby Creek for about 2km of swampy river which would take us to Scrabble Lake. Our map showed that we only had 2 portages to complete, the first being only being 75m and the later being 55m. At this point we were still concerned about water levels. Being such a hot summer and paddling the route in late August, we’re always wondering if historically shallow waterways would even be accessible now. It took us a solid 30 minutes to find the portage that would take us out of Red Boat and into the creek. The map showed a portage left of the creek but all we could find was thick bush. After awhile of paddling up and down the shoreline, we decided to jump out to do a little recon. We’re still not even sure if we were on the right route, but we found a very faint path that brought us to what looked like, a beaver access point into the river. Only being 75m or so we ended up just crashing through the path and putting in at the beaver point. For those of you that find yourself in a similar situation, we marked a big pine tree with tape from where we took out. For the first 200m we were already second guessing our move to try to make it to Scrabble. The creek was being engulfed by emerged, floating, and submerged vegetation with every 10m or so having a log cutting across. For this portion we spent more time out of the canoe in knee deep muddy water than we did paddling. When times started to look grim, we noticed a little light at the end of the tunnel. The meter-wide creek started opening up into a somewhat navigable size. The paddling still required zigzagging and many log pull over’s but it was much more manageable than the first 200m. On a map from point A to B, it is about 2km but because of the amount of maneuvering that must be done, you’re looking at more of a 4km paddle. Along the way, as the map points out, you’ll encounter a few meter-high beaver dams that require pulling over, but after all the logs you’ll have to pull over, they’ll be nothing for you. The 55m portage that will dump you into Scrabble Lake is not marked but can be found by looking for the old tin boat that has been pulled up on shore. The route is more arduous than what would be expected and consists of steep rock. The path we took was marked by small rock stacks and by the time we got to the put-in, the trail was a little over 100m. The route from Red Boat to Scrabble Lake took us a little under 2 hours to complete. By the time we got to the lake it was a little after noon and we had the entire day AND lake to ourselves. We paddled to a gorgeous island site, ate some lunch and reset the system with a swim. As rumours had it, we had great success with the fishing and spent the rest of the day floating around casting at lilypads. Burnie pulled out a personal best as well as many others. Although we did not see anyone while we were there, there is a 1800 m portage leading in from Black Lake. This route is often used by locals who stash tin boats on the lake and ATV in for day trips. This route can also be another access point for canoeists who can park at Moore Lake. We woke at 7:00am to a torrential downpour. If we weren’t on such a tight schedule we may have stayed in the tent a little longer but today was Sunday and we wanted to get home at a decent time before starting the work week. Today we had 16km, 9 portages and the looming open-water paddle across Head Lake. By the time it was 8:00am we were on the water and completely soaked. Being that is was an extremely hot month, the rain was somewhat inviting and rather therapeutic…I don’t know if Burnie thought the same. Today our goal was to get back to the car so we put our heads down and pushed through the Digby Creek without stopping. By the time we reached Head River it was 12:00pm and now we only needed to cross Head Lake. Paddling down the river, the wind started to become a little concerning. It would come in at hard 50km/h gusts around each corner and we were afraid that these may be directed right at us when we reached Head Lake. All that being said, we’re strapping young lads and even if there were strong winds, we were sure that all we needed was a little elbow grease and some strong strokes…boy were we wrong. Head Lake – Head Winds!!! As soon as we turned the corner we got blasted with 55km/h winds heading straight at us. There were massive white caps and the waves were the biggest I’ve ever seen in a canoe. We decided to test the waters and started paddling as hard as we could right at the waves. Every wave we hit I would see the front of the canoe go straight up and then disappear below, bursting right through the next wave. It took about 10 minutes for us to admit we weren’t making it across without sinking or capsizing. We made our way over to the leeward side of an island to hash out a game plan. By this time, it was 2:00pm and the wind showed no signs of slowing down. Our options were to A) Wait out the front which could possibly mean waiting until night or even the next morning B) Paddle the entire shore of the lake to make it over to the leeward side or C) Wave down a boater. It was getting late, we had a long day of paddling and we were already dreading work the next day so we opted for the easiest and quickest solution. We happened to see some fishermen in an old aluminum boat getting worked by the waves so we thought we may as well see if they would be willing to pull us across for some cash. The couple saw our waves and headed over; they were extremely helpful and were willing to pull us across. During the “rescue” the waves got a hold of them and smashed there boat up against some rocks which required about 30 minutes of bailing. Shout out to George and Emily for the help! We got to the launch by 3:00pm and were packed up and heading home by 3:30pm. 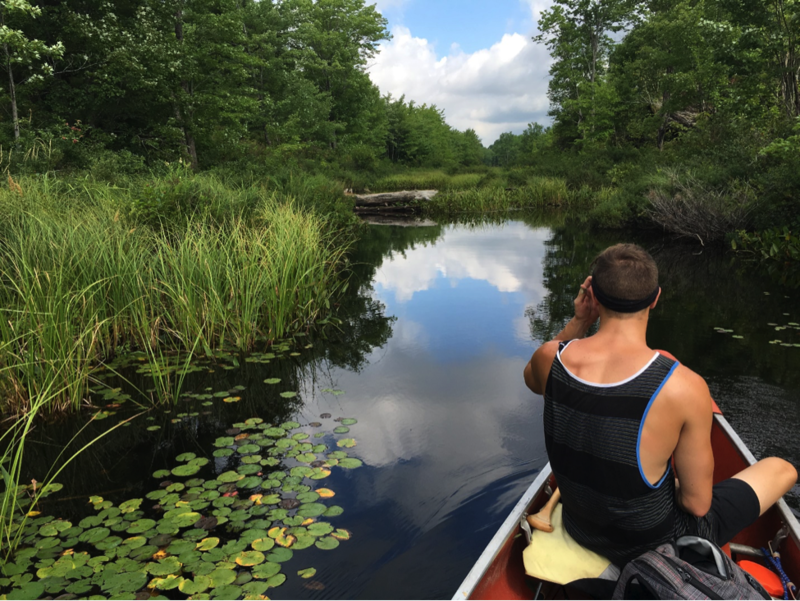 Overall this was a great route for any canoeist looking for a challenging 2-3 day trip in Southern Ontario. The route consists of unmaintained and, in some cases, poorly marked portages which gives it a rugged and remote feel. 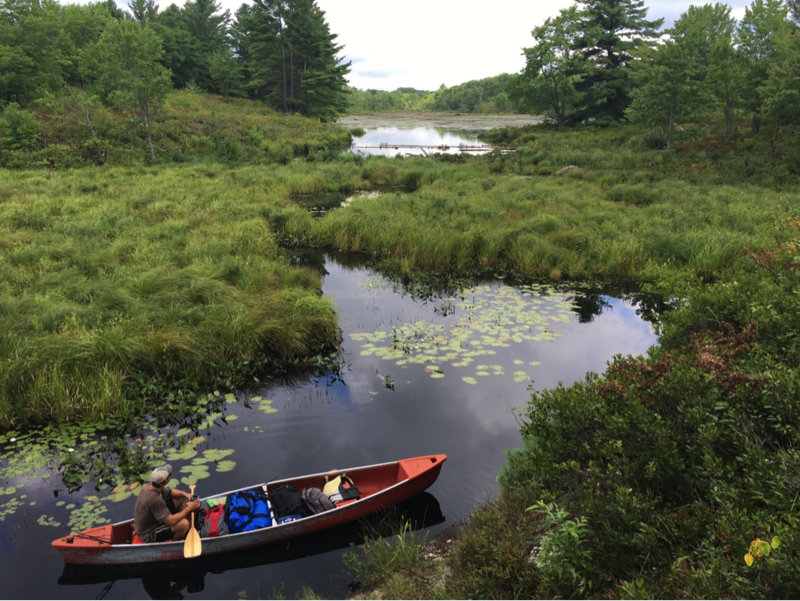 If you can endure the buggy, marshy Digby creek, you’ll be rewarded with pristine, camper-free lakes. Being right in the middle of Kawartha cottage country, this is a hidden gem for any intrepid adventurer.